Fifty-fifth day of the London Blitz. At 19:40 on Thursday 31 October 1940, Piccadilly line services were reversed at North Ealing and Alperton due to track subsidence between Park Royal and North Ealing, where a bomb had fallen the previous week. Normal working resume at 23:09. At 06:15 on the 1st, the Metropolitan line tracks between Pinner and North Harrow were damaged by High Explosive bombs. Services suspended until 09:30. Suspended Norwood to North Harrow. Interruption at Park Royal 21:30, since restored. Fifty-fourth day of the London Blitz. At 11:25 on Wednesday 30 October 1940, District line services were again suspended between Southfields and Wimbledon, due to an Unexploded Bomb (UXB) in the cicinity. Suspended Southfields to Wimbledon - UXB. Shuttle service on both tracks now running Strand [now Charing Cross] to Euston. Fifty-third day of the London Blitz. At 11:02 on Tuesday 29 October 1940, the Waterloo & City line boiler plant was damaged by a High Explosive (HE) bomb, although not seriously. Services between North Ealing and Acton Town were suspended from 18:40 to 19:30 due to a defective train. Trains reversed at Acton Town and North Ealing. From 22:13 to 22:55 services were suspended between Putney Bridge and Wimbledon due to a suspected Unexploded Bomb 20 yards [18 metres] from the track at Southfields. Services between Neasden and Preston Road, and between Golders Green and Edgware, were suspended due to cables damaged by enemy action north of Neasden Power House. An HE exploded between the LNE and Metropolitan line tracks between Neasden and Wembley Park stations at 00:35 on the 30th, damaging siding, signals, and telephone lines, but did not damage the running tracks. Suspended King's Cross to Farringdon Street (Granville Tunnel and earlier damage). Suspended Kennington to Strand [now Charing Cross]. Suspended Warren Street to Camden Town. Single line working Strand to Warren Street on one road, and Strand to Euston on the other. Single line working Wood Green to Arnos Grove. Fifty-second day of the London Blitz. At 16:05 on Monday 28 October 1940, Central line services resumed between Wood Lane and Ealing Broadway. Single line working Warren Street to Camden Town. Camden Town station closed (night only). Fiftieth day of the London Blitz. At 12:35 on Saturday 26 October 1940, Northern line services were resumed between Goodge Street and Warren Street stations. Glass in the roof of Shepherd's Bush Central line station was broken at 20:00. Station closed until commencement of traffic on the 27th. At 05:00 on the 27th, a bomb close to Kennignton station broke glass in the ticket hall. Restricted Queens Park to Willesden & Watford (Kensal Green Tunnel). Suspended North Ealing to Acton - HE damage 25/10 Park Royal. Single line Alperton to South Harrow. Suspended Wood Green to Arnos Grove (Bounds Green 13/10). Suspended Golders Green to Hendon, single line Hendon to Edgware. Suspended Camden Town to Warren Street, single line Warren Street to Strand [now Charing Cross]. Suspended Tooting Broadway to Clapham South, single line Clapham South to Clapham Common. Angel station closed, and Camden Town station closed at night. Suspended Ealing Broadway to East Acton , single line East Acton to Wood Lane (damage North Acton 25/10). Euston - - Mid January. Farringdon Road - January 1st. The LPTB hope to improve on these dates. 1. Hendon 16/10. All lines blocked - London to Golders Green. Forty-eighth day of the London Blitz. At 13:00 on Thursday 24 October 1940, the military carried out a controlled explosion of the Unexploded Bomb (UXB) outside Stockwell station, causing some damage to the building. The station re-opened at 16:55. Warren Street station was closed at 14:45 due to a UXB in the vicinity. Services resumed between Kennington and Clapham Common at 13:25, and between Whitechapel and Bromley[-by-Bow] at 16:00. Baker Street to Stanmore now open. Suspended Wood Green to Arnos Grove - single line working probably today. Camden Town station open in daylight only. Suspended Farringdon to King's Cross. Closed for passengers, open for freight. 1. Hendon 16/10 - all lines blocked, Hendon to Golders Green. 1. Latimer Road, Arch 89 20/10. Forty-seventh day of the London Blitz. At 16:15 on Wednesday 23 October 1940, Stockwell station was closed due to a police report of an Unexploded Bomb (UXB) in the vicinity. Services suspended between Kennington and Tooting Broadway at 05:44 on the 23rd due to another UXB over the tunnel. Praed Street [Paddington] station reopened, with services resuming between Edgware Road and Bayswater. Restricted Queens Park to Willesden & Watford - damage to Kensal Green Tunnel (1 month). Suspended Wood Green to Arnos Grove (several weeks). Suspended King's Cross to Finsbury Park (several weeks). Suspended Tooting Broadway to Kennignton (UXB at Stockwell). Suspended Kennington to Mornington Crescent (via Charing Cross [now Embankment] only); shuttle service between Strand [now Charing Cross] and Warren Street. Camden Town station open for interchange only. Suspended Whitechapel to Bromley[-by-Bow] (2 days). 3. Stockwell 23/10, station closed at 16:15. Forty-sixth day of the London Blitz. At 12:28 on Tuesday 22 October 1940, there were signal current problems at Kentish Town. Trains run in series from Archway to Camden Town. Suspended Morden to Clapham Common & Tooting. Suspended Kennington to Mornington Crescent (several weeks). Suspended Turnham Green to Richmond. Now running Charing Cross [now Embankment] to Mansion House. Suspended Edgware Road to Bayswater. Closed for passengers - open for freight. 2. New Cross Gate 16/10. Forty-fifth day of the London Blitz. At 09:17 on Monday 21 October 1940, there was signal trouble at Finchley Central; northbound service reversed at Archway. A bomb fell near Bridge No. 10 between West Hampstead and Kilburn, near the junction of Netherwood Street and Linstead Street, at 09:50, and services were suspended between the two stations. At 20:40 an Oil Bomb hit the hospital adjacent to Colindale Sidings, damaging cables. Debris on the line at Aldgate East at 21:15 due to a bomb in the vicinity. At 22:16 a High Explosive bomb (designated 18/B in the drawing below) fractured the tunnels between Mornington Crescent and Euston on the Charing Cross branch of the Northern line. Water from broken mains entering the tunnel caused a power surge, tripping high-tension cables at Leicester Square, Belsize Park, and Golders Green. Failures at associated sub-stations also affected trolley bus services, and auto telephones north of Euston were disrupted. A gas main was also fracture, and the tunnels filled with debris. Services suspended between Strand [now Charing Cross] and Mornington Crescent. See below for further details. Suspected bomb on the track at Hounslow West at 21:12. Westbound services reversed at Hounslow Central until 21:30. Services suspended between Mansion House and Whitechapel at 21:45 due to debris on the track. Services resumed the following day. Restricted Queens Park to Willesden & Watford. Suspended Clapham Common to Tooting. Suspended Golders Green to Colindale. Suspended Kennington to Mornington Crescent - damage at Eversholt Street 21/10. Camden Town station available for interchange traffic only. 1. Edgware Road station 20/10 - no interference with services, but prevents use of lifts and esclators. "AT 10.10 p.m. on 21/10, one or more H.E. bombs (probably 500 kilo) fell and exploded in the centre of the street (wood blocks on concrete) at the junction of Eversholt Street and Phoenix Street (a continuation of Seymour Street) immediately outside the Eastern boundary of Euston Station and 100 yards [91 metres] south of the R.C.H. [Railway Clearing House] I understand that this was a deliberate dive bombing attack on Euston from just above the balloon barrage. Water mains of 16 in., 6 in., and 4 in. were fractured and before they could be closed (1½ hours?) water ran into the tunnels, flooded the suicide pits in the station and flowed southwards through the tunnel into the dip on the north side of Warren Street; but at no place were the tunnels flooded to a serious depth, and I understand that the station pumps (automatic) held the water, pending the provision of emergency pumping appliances." "A train on the south-bound road had just passed the point of damage when the explosion occurred, and windows in the rear part of the train were broken. Fortunately there were no casualties and refugees were cleared out of the station as a precautionary measure. Five trains were shut in between Euston and the river and will have to be worked back to Kennington by opening the floodgates. It is proposed, however, to retain one train in each tunnel in order to work a shuttle service between Euston and Strand." "The Company had made good progress, 7 or 8 rings of a 7 ft. pilot tunnel having been erected in the one tunnel. The face had dried out considerably and appeared to be more consolidated than was anticipated. Captain Lander said that a flagstone or two had been met besides a quantity of tunnel iron. In breaking away a piece of tunnel iron, the previous shift had cut a Post Office telephone cable which was located just outside the pilot iron. Post Office Engineers were making an examination at the same time, and were effecting repairs. Below the cable was one of the main secret Post Office telephone cables, which was also fouling the pilot iron. Another cable was apparently cut as a result of the accident." Traffic resumed on 22 February 1941, after reconstruction of 34 rings of iron in one tunnel, and 41 rings in the other. On 28 February 1941 the civilian contractors (who remained responsible for the work being carried out by the Royal Engineers) sent Mount a piece of the bomb that had been uncovered during the repair work. Mount invited Wing Commander JCM Lowe of the Ministry of Home Security to examine the find, which he was able to on 5 March, making the judgement that it was a fragment from a 500 kilo device, but that the piece was so large that it suggested that the casing was weak due to poor manufacture, and it had fractured before detonation was fully complete. Forty-fourth day of the London Blitz. On Sunday 20 October 1940, a High Explosive (HE) bomb blocked the District line tracks at Upminster. An Unexploded Bomb (UXB) near Aldgate East station at 14:17 suspended services between Farringdon and Whitechapel, between Whitechapel and Mansion House, and between Mansion House and Whitechapel. Full services resumed at 16:40. There was a bomb explosion between Colliers Wood and South Wimbledon on the Northern line, and water was reported in the tunnel. Services suspended between Tooting Broadway and Morden at 15:40 for a tunnel examination. Services resumed at 18:37. A fire 50 yards (45 metres) from the Northern line track between Golders Green and Brent [Cross] suspended the existing single line service at 20:03. At 20:10 a bomb blast struck the the signal box at South Kensington station, while a bomb at the west end of the westbound platform at Turnham Green station damaged the signal box, and derailing the rear part of a departing train. Debris was also reported on the track between Barons Court and Earls Court. Current off between Ravenscourt Park and Chiswick Park. District line services suspended between Earls Court and Acton, and Piccadilly line services between Hyde Park Corner and Acton Town. Piccadilly line services between Hyde Park Corner and Hammersmith resumed at 22:36. Also at 20:10, all tracks between Willesden Green and Neasden were blocked. Single line working between Willesden Green and Wembley Park at 22:59; southbound local at 04:58, and northbound local at 05:47. At 20:23 HEs hit the bridge carrying the District & Piccadilly line tracks over Turnham Green Terrace. Addison Road station was hit by multiple HEs at 20:50, various station buildings being partly or wholly destroyed, and the track cratered and damaged. Neasden Metropolitan line station was hit by two HEs at 21:20, leaving the track blocked by debris and a crater, and power cables displaced. At 21:26 a bomb damaged the footbridge at Bow Road station, blocking Up and Down lines with debris. A UXB was reported 100 yards (91 metres) south of the signal box near Latimer Road station, although it was noted that the bomb may have already exploded under the ground. Another UXB was reported 30 yards (27 metres) west of the station at 22:20, and a third one 20 yards (18 metres) from the signal box at 23:45. Services suspended between Hammersmith and Ladbroke Grove. Between 23:30 and 23:45 the Northern line's southern terminus at Morden was hit by an HE and an Oil Bomb, with the first hitting track south of the station, and the second landing on a shed in the Depot. At 00:05 on the 21st, several bombs damaged cable bridges and cables at the Northern line's Highgate Depot. Current off. The LPTB headquarters at 55 Broadway were hit by a falling anti-aircraft shell, which penetrated the north east roof and internal floors at 00:58, but caused no casualties. Services were suspended between Golders Green and Colindale at 03:25 due to a UXB on Burroughs Playing Fields. At 05:12, adjacent to Golders Green station, 25 Golders Green Crescent was hit by an HE, damaging retaining wall arches. Restricted service Queens Park to Willesden & Watford. Baker Street to Stanmore normal. Single line working Clapham South to Clapham Common. Camden, Angel, and Old Street closed. 2. Surrey Docks 16/10 (East London line). 3. New Cross Gate 16/10. 1. Woodside Park 14/10 - services suspended (2 UXBs). 2. Angel station 15/10 - UXB in forecourt of station. 3. Golders Green Depot 11/10 - trains unable to stabled in yard. 4. Edgware Road station 20/10 - no interference with services, but prevents use of lift and escalators. A large Incendiary Bomb the size of a domestic dustbin, dropped by parachute. Forty-third day of the London Blitz. At 11:25 on Saturday 19 October 1940, single line working between Bayswater and South Kensington due to damage at Praed Street [Paddington] station. Services suspended between Enfield West [now Oakwood] and Cockfosters from 13:10 due to an Unexploded Bomb [UXB] at No. 8 siding, Cockfosters. At 20:10 services were reversed at Northfields due to bombs in the vicinity of Boston manor station. Services resumed at 20:55 after a track inspection. At 20:40 there was a heavy explosion at Euston, with water reported to be percolating through to one of the southbound Northern line platforms. Current was off between Wimbledon Park and Wimbledon stations at 20:47; trains reversed at Wimbledon Park. District line services suspended between Barking and Mansion House at 21:15 due to bomb damage at Bow Road station. A Delayed Action (DA) bomb was reported 30 ft (9 metres) from the King William Street entrance to Bank station at 21:17. The station was closed, but exit allowed via Monument station. Central line services were suspended between Wood Lane and Ealing Broadway at 21:58 due to a bomb adjacent to North Acton station. The track at Baker Street was covered in debris, and signals damaged, at 22:00. At 22:05 a High Explosive (HE) bomb on the south side of Marylebone Road damaged the District/Metropolitan line tracks. Richmond to Turnham Green suspended at 22:25 due to enemy action. Resumed Richmond to Gunnersby only at 22:55. At 22:30 Incendiary Bombs (IB) landed on the roof of the LPTB headquarters at 55 Broadway (see report of 14/15 October, here), but were dealt with by staff before any damage was caused. At 23:30 the roof of Aldgate station was on fire. At 00:03 on the 20th, an HE bomb fell in Spur Road, Waterloo, and penetrated to the Waterloo & City line depot. Nos. 6 & 7 sidings were reported at 01:35 as being blocked with debris. At 02:25 the heavy steel cable of a barrage balloon was reported across the track at Goldhawk Road station. 10 mph speed limit between Tower Hill and Aldgate East from 05:30 to 06:15, due to defective signals. Northbound trains reversing at Queens Park. Suspended Ealing to Wood Lane - bomb damage at East Acton 19/10. Suspended Enfield West to Cockfosters. Suspended Upton Park to Whitechapel - bomb damage at Bow Road 19/10. Suspended Queens Road to Edgware ROad. Single line working South Kensington to Queens Road. Suspended Hendon to Golders Green. Shuttle service Hendon to Edgware. Single line working Golders Green to Brent [now Brent Cross]. Camden Town station closed, interchange only. Old Street station closed, interchange only. Bomb through tunnel east of Baker Street blocking Circle line. Services suspended Queens Road [Bayswater] to Farringdon. 4. Cockfosters (No. 8 siding) 19/10 - services suspended Enfield West to Cockfosters. Forty-second day of the London Blitz. At 18:30 on Friday 18 October 1940, District line services were suspended between South Kensington and Edgware Road due to damage at Praed Street [Paddington] station. Ealign Common station was closed at 21:15 due to bombs in the vicinity. Angel station closed, interchange only. Suspended South Kensington to Edgware Road - Praed Street Station unsafe. 2. East London Tunnel 17/10 - Land Mine in River, lines blocked. 3. Woodside Park 14/10 - services suspended (2 UXBs). Forty-first day of the London Blitz. At 09:50 on Thursday 17 October 1940, Northern line services were suspended between Brent and Hendon Central due to a Delayed Action bomb in a bank adjacent to Hendon Central. Single line working between Hendon Central and Edgware from 10:04. Praed Street [Paddington] station was closed at 18:30 due to unstable walls. ervices were suspended between Northfields and Hounslow West due to a bomb in the vicinity of Hounslow East, from 20:10 to 20:17. The District line was suspended between South Kensington and Queens Road (suspected current rail problems) from 20:19 to 21:00, and between Gunnersby and Richmond from 20:22 to 02:18 on the 18th. Bombs in the vicinity of Bromley-by-Bow at 21:15 suspended services from Bow Road to Plaistow until 22:05, while current problems suspended services between Wimbledon and Wimbledon Park from 20:55 to 21:20. At 21:45 eight high-tension feeders at Greenwich Power Station were out due to enemy action. Trafalgar Square station closed, trains passing. Suspended South Harrow to Rayners Lane - fire in vicinity. Suspended Turnham Green to Richmond - current supply difficulties. Praed Street Station [Paddington] closed, trains passing. Thirty-eighth day of the London Blitz, which saw the highest death toll on the London Underground on a single day due to direct enemy action during the entire War. At 19:35 on Monday 14 October 1940, High Explosive (HE) and Incendiary Bombs (IB) hit the District line tunnel between Blackfriars and Mansion House, damaging both stations. Services reversed at Aldgate East. Single line working was instituted between Wembley Park and Canons Park at 19:45. At 20:02, a 1,400 kg semi-armour piercing bomb struck the road surface on Balham High Road, just north of Balham Northern line station. Penetrating deeply before detonating, the bomb then exploded, causing a massive crater on the surface, whilst simultaneously breaching the northern end of the north-bound platform tunnel. The bomb landed only a few yards in front of a northbound number 88 bus, and the driver was powerless to prevent his vehicle crashing into the crater. 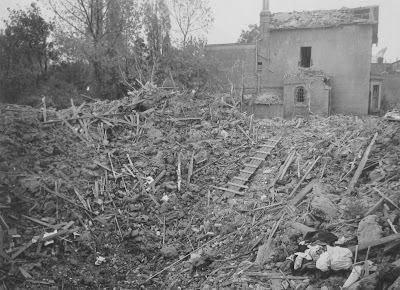 An avalanche of earth, debris, and water from broken mains and sewers flooded into the station, which was packed with people sheltering from the air raid, causing multiple fatalities. The running tunnels between Clapham South and Tooting Bec stations were also flooded. Southbound trains were reversed at Clapham Common, with current off south of the latter station to Morden. See below for further details. At 20:28, two 500 kg bombs (designated A/3 in the plan below) landed on Bayswater Road, 50 feet [15 metres] apart, and 60 feet [18 metres] above the Central line between Queens Road (now Queensway) and Lancaster Gate stations. The tunnels suffered only slight damage, and traffic was not interrupted. At 20:57 a 250 kg bomb (designated "151/B" on the plan below) exploded on the west side of Camden Town station, demolishing part of the building, and damaging and blocking the top of the escalators. At the time a number of people were sheltering from the air raid, both on the platforms, and at the top of the escalators, and five were killed immediately, or sustained injuries from which they later died. Approximately fifteen members of the public and five LPTB staff were injured. Services were initially suspended between Euston and Moorgate, and between Strand (now Charing Cross) and Golders Green/High Barnet, although they later resumed between Archway and High Barnet, and Golders Green to Edgware. At 22:06 through services between Strand and Edgware and High Barnet resumed, and at 22:55 between Moorgate and Euston. As only the station building was damaged, traffic through this vital choke-point of the Northern line was not significantly interrupted. At 21:07 a second bomb (designated "SP9" on the plan above) landed in Dewsbury Terrace, which forms the top side of the inverted triangle of land on which Camden Town station is situated, but this not cause further damage to the Underground. At almost exactly the same time, to the south, a bomb (designated "SP9" on the plan below) demolished a four-storey building approximately 200 metres north of Mornington Crescent station, and almost over the Northern line tunnels, but again not significantly damaging them. A 500 kg bomb exploded over the Piccadilly line about 100 yards (91 metres) south of Holloway Road station at 21:30. All current off between Hyde Park Corner and Wood Green, with eastbound service reversing at Hyde Park Corner, although at 23:53 services were extended to Covent Garden. It was later discovered that segments of both tunnels were cracked, partially filling them with clay for about 60 feet (18 metres). Low tension cables were burnt through, and the current rail was displaced for, "a considerable length," although there was reported to be little ingress of water. Repairs were started on 18 October, and finished on 3 December, with traffic resuming two days later. Oxford Circus station was closed at 21:50 due to flooding. At 22:30 eastbound District line trains were reversed at Bow Road due to bombs at Plaistow. The London Passenger Transport Board's headquarters at 55 Broadway, directly over St James's Park station, was hit by an HE at 23:59, setting the west wing on fire. "Information generally is very incomplete. The HQ of the Board, 55 Broadway, were reported hit by an HE; considerable fire started. No details yet." 1. Canons Park 09/10 - services suspended between Stanmore and Wembley. 2. Woodside Park 04/10 - services suspended. 3. Golders Green Depot 11/10 - trains unable to be stabled in yards. 4. Neasden Depot 13/10 - no interference. "At 20.02 hours (precisely) on 14/10, a heavy bomb (presumably 500 kilo?) fell on the north-bound tramway track in Balham high Road, some 200 yards [183 metres] north of the Southern Railway main (Brighton) line 4-track bridge over this road, 1½ miles [2.4 km] south east of Clapham Junction and the same distance north west of Streatham. This site was immediately over the north end of the north-bound tube platform where the tunnel lining is 22 ft. 1½ in. diameter, and about 27 ft. below the surface of the road. The top of the tunnel was broken in to an extent which is at present unknown; the south side of the fracture being located some 18 ft. north of the platform clock. The road carried three 30 in. water mains and one of 10 in. ; also a 4 ft. x 2 ft. 8 in. sewer and two gas mains 6 in. and 8 in. All the mains were broken as also many cable and of course the tram lines. A large quantity of shingle, silt, and water and some clay ran through the cavity into the tunnel with the result that the final crater extended completely across the road from shop to shop, its diameter being some 60 to 70 ft. A north-bound No. 88 bus had pitched headlong into it at a steep angle, the conductor's platform coming to rest just above the level of the roadway. It will be a big operation in itself to get the bus out. Entering the station via the escalators, we walked through the sliding watertight door on to the shingle and silt covered platform and up to the bottom of the crater through which there was daylight; the dept of the shingle and silt over the platform was 4 or 5 ft. tapering off to nothing at the south end of the platform. The Stationmaster's office was located at the north end of this platform on the north side of the crater, but we did not inspect that side and at present I have not heard whether anyone has done so. The shingle had flowed out through the one sliding and one hinged watertight doors on this platform into the escalator chamber. There is another sliding watertight door from this chamber giving access to the south-bound platform through which the Fire Brigade were pumping out this tunnel. Water was still draining from one of the mains into the crater like a small waterfall." "With the police, we interviewed Mrs. F Chalmers of 20 Southey Road, Kennington, who was accustomed, with her friends, to shelter at the south end of the north-bound platform. We gathered that, after hearing the bomb, she felt no blast (and she had had experience of bomb blast), but the lights went out. She was certain that the watertight doors were closed and that members of the public immediately opened them, the rush of water and shingle being heard; in the darkness they were able to get away from the platform, and Mrs. Chalmer's general impression seemed to be that few were left behind. The numbers taking shelter were apparently normal. Mrs. Chalmers referred to the Stationmaster and his relations who were usually collected near his office, and she thought they must have been buried. No. 5 Group Co-Ordinating Officer, Civil Defence, informed us that his reports up to date varied from 12 to 22 dead and he thought 40 to 50 was an outside guess for those who had been caught under the debris. It must depend largely upon how closely people were lying. Some digging had already been undertaken in the search for bodies, but I think the suggested figure of 200 is clearly an exaggeration and, having regard to the comparative slowness with which the shingle, silt and water must have come in, I shall be surprised if the numbers killed are not considerably less than the above-mentioned guess." "The men are now working under better conditions, and gas masks are no longer being used; disinfectants are plentiful and I understand there has been no undue sickness. Having regard to the conditions, the men receive an additional allowance. By means of tarpaulins over the top of the shaft, operation are being carried on continuously; some 60 men are working by day and 30 by night. Up to date, some 40 bodies have been accounted for, but a considerable number (I gather perhaps 20 or more) still remain to be recovered from the invert under the platform; also from the cross-passage on which the bomb fell." "Wing-Commander Lowe today examined the piece of the bomb in my office, and stated that it was of 1400 kilo. type, semi armour piercing, overall length 10 ft., diameter 22.3". The same type of bomb was responsible for the damage at Sloane Square [on 12 November 1940]. Many other smaller fragments have been collected from inside the tunnel, and there seems to be no doubt that the bomb fell at an angle, west to east, and exploded on hitting the lintel girders of the 11 ft. 8½ in. cross-passage at its junction with the North-bound tunnel, some 32 ft. below surface." The more of the site was cleared, however, the more apparent it became that the earlier estimate that work could be completed by Christmas was overly optimistic, and it was more likely to be the middle of January. Total expenditure was expected to be, "in the order of £25,000 to £30,00, perhaps more," the equivalent of £1.2 to £1.4 million today. In the event, traffic through the station resumed on 8 January 1941, with the station itself reopening again on the 19th. For many years the Commonwealth War Graves Commission recorded sixty-five people as having died in the stations. One previously unrecorded fatality was added in May 2010, making sixty-six in total. Thirty-seventh day/night of the London Blitz. On Sunday 13 October 1940, windows at Bow Road District line station were broken by a nearby bomb blast. At 09:30 District line services were reversing at Mansion House and St James Park. Green Park and Hyde Park Corner stations were closed at 14:00 and 14:20 respectively, due to heavy firing of Anti-Aircraft guns in the Parks themselves. Both reopened at 14:50. Wembley Park station was hit by two High Explosive (HE) bombs at 19:47, damaging telephone wires and signals. The high-tension feeders at Harrow sub-station were damaged at 19:50. Power restored at 21:05. At 19:59 a nearby HE shattered glass in the roof of South Kensington station. A bomb close to Stanmore station at 20:07 injured a booking clerk, and killed 32-year-old Eric Charles Sargent, who lived in one of the flats above the station building. Glass in the station was smashed, and LPTB huts damaged. Service between Camden Town and Golders Green were suspended from 20:20 to 21:08 for a track examination. At 21:15 a bomb from a lone enemy aircraft demolished two houses directly above the east end of the westbound platform tunnel of Bounds Green Piccadilly line station - the image above shows the remains of the houses, with the wartime shielding to the station's ventilation tower being just visible top-right. Approximately 6-to-8 segments of tunnel collapsed on the scores of people on the platform sheltering from the air raid. Services were suspended between Wood Green and Arnos Grove, although they were resumed between Cockfosters and Enfield West (now Oakwood) the following day. See below for further details. Paddington (Praed Street) station on the Metropolitan line was hit by three bombs at 23:00, damaging the roof, platforms, and track. Five people were either killed immediately or died of the injuries in situ, one person died in hospital the same day, and two on the following day, making eight in total. Services suspended between Edgware Road and South Kensington. The short Metropolitan branch line to Chesham was suspended between 23:10 and 00:45. Bakerloo line services between Wembley Park and Baker Street were suspended at 23:21, and resumed at 08:10 the following day. A bomb in the vicinity of Lords Metropolitan line station - between Baker Street and Finchley Road - at 23:21 damaged a retaining wall. At 01:06 on the 14th, Incendiary Bombs on West Brompton District line station started a twenty-pump fire. Northern line services were suspended at 07:20 between Woodside Park and High Barnet due to a suspected Delayed Action (DA) bomb near Woodside Park. At 09:50 a second DA was discovered nearby. "At about 21.17 on 13/10, a heavy bomb (500 kilo?) fell on two houses (Cranbrook) in Bounds Green Road, some 120 to 130 yards [119 to 128 metres] north of Bounds Green Station booking hall. The house (not the Board's property) were completely demolished, killing 4 people, and a huge crater was formed, 60 to 70 ft. [18 to 21 metres] diameter, and depth being about 20 ft. [6 metres] This was immediately above the north end of the southbound platform, where the tunnel is 21'1½" [6.4 metres] diameter, the top of it being 37 ft. [11.3 metres] below the surface; the tunnel iron was 1¼" [3.2 cm] thick. The station building was not affected and the escalators (51.88 ft. rise) remained running; nor was the lighting affected. The top 22 segments of the platform tunnel, immediately under the crater, were broken in, and clay and debris fell through the hole, some 40' x 20', thus formed in the roof. Some 200 tons of debris filled the tunnel, enveloping refugees on the platform, 17 of whom were killed and 59 injured; it is estimated that 12 to 15 are still buried, and a temporary tunnel in iron will be commenced tonight at platform level to extricate the bodies. The concrete lining inside the tunnel segments will have to be removed before full examination can be made of the lining, but no doubt more than 22 rings are affected. The adjoining northbound tunnel was evidently shaken and moved, longitudinal cracks being apparent in the tiling and concrete filling. The platform nosing at the north end was also shifted 3" towards the track, which gives an idea of the vibratory movement. The platform had already been realigned in cement by the Board's staff, and the track appears fir for traffic; but it will be unsafe to put it into operation on account of the instability of the crater debris, and until the loose muck is secured it seems unlikely that the northbound line can be opened, say, for ten days." "The attack cannot have been directed towards the Tube, and the hit must have been fortuitous; it appears that the enemy was attempting to cut off King's Cross, by hitting the south end of the L. & N.E.R. main line tunnel between Wood Green Station and New Southgate, the south end of the tunnel being only a few hundred yards to the west of Bounds Green Station. The main line here has ordinary signals and not colour-lights, but there was brilliant moonlight. This appears to be the only explanation as there is no aerodrome nearby." Added by hand to Mount's report was: "This is the 6th bomb damage to Tube tunnelling." The damage was so extensive that it was decided that the only way to tackle it would be to expand the crater into a timber-lined trench covering the whole width of the damaged platform tunnel, which could then be rebuilt, before being covered over again. Mount estimated that this would require, "some 4,000 running feet of 12' by 12' and 14' x 14' timbers, at least 34 ft. long." Repairs were started on 25 October, and completed on 12 December. Traffic was running again four days later, and the site cleared the following day. "In fact, nineteen people were killed, all except three of whom were Belgians. A local colony of refugees from Belgium had ensconced themselves at the far end of the west platform on the first night of the blitz. They kept themselves to themselves, and it was only because they had been blitzed out of two homes in forty-eight hours that the foreman ticket-collector had permitted three British subjects to shelter in the Belgians' section of the platform. The ticket-collector had just made this arrangement when he decided to ascend to ground level and make a personal reconnaissance of the blitz overhead. A solitary German aircraft had been flying round for nearly half an hour, evidently in search of a particular target. As the ticket-collector stared upwards he heard the whizz of a bomb, followed by a crash of glass. The bomb had fallen on top of four 3-storeyed house to the right of the station. The ground did not vibrate unduly and he presumed that no particular damage had been done. However, as he walked down to platform level he heard screaming. Half the platform was in darkness. At the far end he could see that the tunnel had caved in. Having allocated the sleeping accommodation only a few minutes previously, he knew that at least sixty people were involved. Crowds were milling around the safe section of the platform. He promptly sent a porter to the local A.R.P. headquarters and, himself, hurried to a nearby hospital which provided two doctors and six nurses. With these reinforcements he returned to the scene and made his way behind the debris where he found fifteen or twenty injured Belgians. These were removed to hospital.... By 3.0 a.m. all the injured people had been taken away, but nearly a week elapsed before all the corpses had been removed." "It was particularly poignant that the strict allocation system had been instrumental in selecting the victims. Sixteen of the fatalities were Belgian refugees who were permanently allotted to the east end of the platform. The remaining three were British newcomers to the shelter who had been temporarily placed in the Belgian area by the station foreman." "The nature of the casualties [at Bounds Green] made this a particularly tragic episode. Sixteen of the dead were Belgian refugees who had fled their country at the time of the Dunkirk invasion and had created a Belgian enclave at one end of the platform. On this particular night they had welcomed three English people who had been bombed out of two homes. All nineteen were killed." In actual fact, however, the Commonwealth War Graves Commission records sixteen people dying at the scene - only three of whom were Belgian - and a seventeenth dying in hospital. Another four people were killed in the houses demolished by the bomb. It is notable that these figures match those in Mount's initial report precisely. Apart from the three Belgians, all the surnames of the victims suggests that they were of British extraction, with the exception of four members of a family with an Italian surname, although there is strong circumstantial evidence to suggest that they were all born in the UK, rather than being recent immigrants. Their home address, however, was some eight kilometres from the station, more than twice as far as all the other victims, with the exception of a Women's Voluntary Service member, who may very well have been at the station in that capacity. This suggests, then, that it was the Necchi family who were the recent arrivals in the area.